Lewis Marlowe avoided the Sunset Saloon whenever he could. For one thing, he wasn’t entirely wild about the idea of there being a “saloon” in his town, given that it was already something of a relic of the Old West. Several years ago, Glandon, Wyo. had been on the list of abandoned ghost towns of the semi-mythical “Old West,” and the attention it gained as a result led to its rebirth as a functional town. Lewis had moved there because, as it happened, he owned some old family land on the outskirts. But living in a former ghost town was trouble enough without its saloon re-opening. It was basically a tourist attraction. Lewis also disliked the Sunset Saloon because of its namesake. The back of the building was positioned facing a wide open plain that stretched out to the west. There was also a small graveyard in the back of the saloon, and it was said that the place got its name from the effect that the setting sun had on the stones. Rumor had it the light of the sunset at dusk would be blocked by the gravestones, casting little figures of shadows against the back wall of the saloon. Those who fancied the label “ghost town” more literally believed that as the shadows were cast, the spirits of those buried populated the saloon. Needless to say, this only added to the tourism appeal of the establishment. Lewis had never bothered to see how the shadows actually looked before dark. Another reason to steer clear of the saloon was that Lewis just didn’t really see the point of it. Anyone who attended and wasn’t just a passing tourist usually did so for two reasons: to drink, and to gamble. And Lewis preferred to engage in both activities at home. He was a solitary drinker, and while he—like everyone else in Glandon—gambled, he preferred to do so online. In spite of himself, he’d even found a platform with a video blackjack option that invoked the Old West spirit, and found it a little more satisfying than stepping out into the actual Old West. You know, the one that had been rebuilt just steps outside his home. A case of his beverage of choice and some online card playing made for just a fine night, as far as Lewis was concerned. But above all else, Lewis avoided the Sunset Saloon because every time he was there, he became the subject of unwanted attention. The thing was, half of those gravestones in the backyard of the place were there because of his own great-great-grandfather… allegedly. The story was that in one of the earliest noteworthy poker games ever played, this ancestor of his (Sylvester Marlowe, if the records had it right) had gotten deep into a hand without enough silver to back up his bets. Rather than accepting a debt to a group of men no one wanted to be indebted to, Sylvester Marlowe had gone for his revolver and started shooting. Six men died—two by the bullets of old Marlowe, and the rest when the barkeep lifted his shotgun from beneath the counter to defend his establishment. It wasn’t long after this incident that Glandon had been abandoned as settlers pushed farther west, but somehow or other the history had been dug up. The name “Marlowe” was here and there throughout the town, ready and waiting to lend its reputation to Lewis when he moved in. It wasn’t that anyone held the actions of a crazed old prospector from 150 years ago against him; if anything, Lewis was treated like the smallest town in Wyoming’s only celebrity. But there was something disconcerting about every eye in a room following you because your great-great-grandfather murdered people in the same room. Despite all this, Lewis was not one to turn down free money, and that’s exactly what led him back to the Sunset Saloon for the first time in a number of years. He’d been sleeping soundly one Friday night in the small but comfortable home he built on his family’s land, when a small thudding sound woke him up. It wasn’t unusual, really. Glandon was built into nature more than in place of it, and as a result there were often little critters making the rounds in the dead of night, uninhibited by the relatively small human population. But something about the sound had been a little bit different, and it prompted Lewis to get out of bed and have a look around. Nothing inside seemed out of the ordinary, but when he opened the front door he found a note attached. It wasn’t taped there, but nailed right onto the door, the way it might have been in the town’s previous, more primitive life. The note was folded in half, and something was fastened to its center. Lewis frowned. That was about as weird as it got. Who the hell would choose not to collect cash for a $500 chip because it had been won with luck? Weren’t all poker chips won at least in part because of luck? Either way, the chip was undeniably legitimate, and he pocketed it and went inside and back to sleep. It had been a bizarre disturbance, but you didn’t live in a ghost town without developing a high tolerance for nonsense. The next night, Lewis had a few drinks at home and made his way over to the Sunset Saloon, determined to do what he could with the $500 chip and be done with it. Again, he wasn’t one to refuse money, and it wasn’t as if he was scared of the saloon—he just didn’t have any interest in it. “Evening, Mr. Marlowe,” said Cole Watford, the resident barkeep. Watford, like half the rest of the town, seemed hellbent on preserving its Old West atmosphere, and did so by styling himself as closely as he could after the Marlboro men. Lewis had tried telling him once that one of those very men had once died in Wyoming, but Watford had merely shrugged and lit up another cigarette. Safety be damned, this was the Old West. Lewis nodded, took his beer and headed into the back room. He didn’t see or hear Cole Watford emerge from behind the bar counter to block the main door. 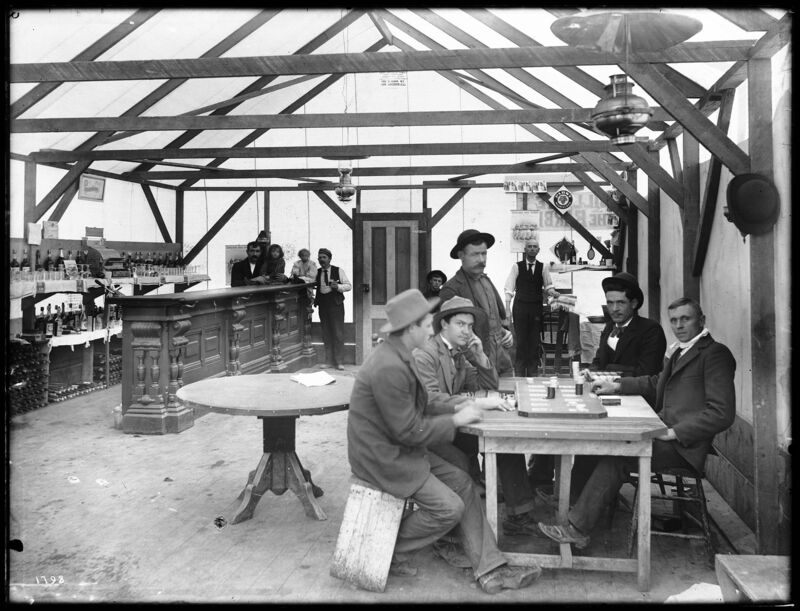 The poker table in the back room had a single lantern hanging over it and its own bar counter in the back, as well as its own bathroom. No one was seated at the table, though cards were already dealt and chips were already on the table. A light was on under the bathroom door, and two men were behind the bar counter—Simon Wells, and Martin Hawthorne, both of whom Lewis knew from around town. They nodded at him and continued with their conversation, and Lewis took a seat at the table. “So, uh…. Who all’s playing? We got a dealer or what?” Lewis asked, a little puzzled by the apparent lack of interest in the game. Neither Simon nor Martin answered him, and whoever was in the bathroom didn’t come out. Lewis looked toward the bar. “Hey. Simon, Martin… what’s the deal, fellas, are we playing poker? We waiting for more people?” Again, neither of them answered. But Simon shook his sleeve up and looked down at his watch. He glanced meaningfully at Martin, and then over at Lewis. “What’s that?” Lewis asked, frowning. Martin knelt down and Lewis could hear the sound of a creaking hatch opening up behind the bar. Martin disappeared, and Simon tipped his cap at Lewis and followed. It looked like a popular game night charade, with someone pretending to climb down stairs behind a couch, only Lewis could hear the echo of footfalls on cellar steps. In fact, he could hear them from more than one place—the bathroom light had gone out, and it seemed that however had been in there had also had a secret staircase to disappear with. “Almost sundown, Mr. Marlowe…” Simon called again, his voice a little more distant, before the latch behind the bar counter thudded shut. Lewis was alone in the back room, and looked around him expecting some sort of joke. He set his $500 chip on the table and glanced at the setup: five hands dealt, besides his own. Then the room went dim. Three of four candles in the lantern above the table blew out inexplicably, and Lewis swept his gaze around looking to see if a door had opened. Then he saw them: five smudges, growing darker and more defined against the back wall of the saloon. The sunset shadows, making their impression. Only Lewis shook his head and realized he shouldn’t be able to see them from the inside of the room. That wasn’t how shadows worked. Seconds later they’d disappeared, and Lewis let out his breath, sitting back in his chair and deciding he’d imagined it. Damn town playing its ghostly tricks again. But then he reached for his chip, ready to collect it back and leave the tavern, and he saw that the other five hands of cards at the table had been picked up. Each hand hung suspended in space at its place in the table, held up by invisible hands. A cold voice slithered through the air from directly across the table.